"If you really knew me, you'd know..."
- I LOVE being a mom. I think it's my favorite thing I've ever done. When I was little I wanted a ton of kids but didn't want to be married or work (I was little, didn't like boys and didn't understand how kids were even made!) That changed. I went to college moved to a new city on my own and started my career. Then I married my high school sweetheart (who I continued dating throughout college) and after 4 years of marriage, decided to start our family. I'm in love with being a mom and can't imagine anything better. - Until today, I had never been stung by a wasp, bee, scorpion...anything that stings really. 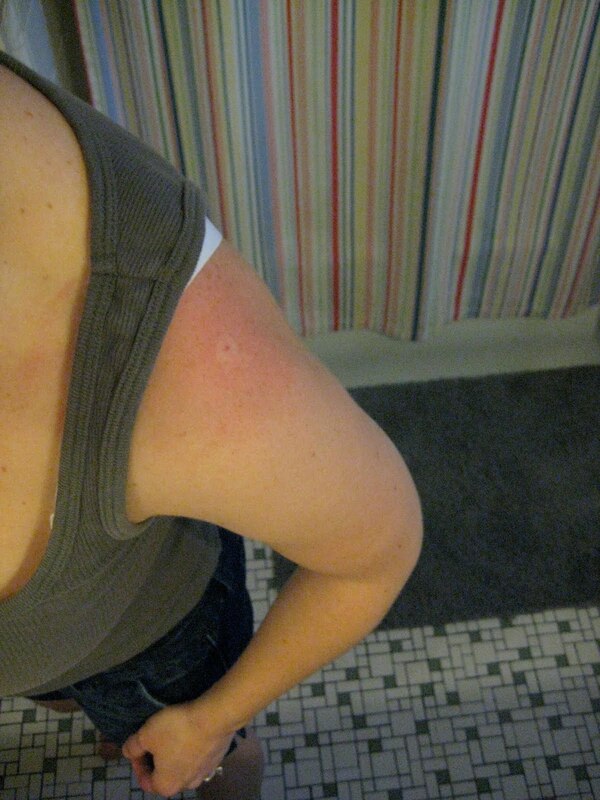 Stupid wasp, my arm is still sore. - I'm a closet Jersey Shore watcher. Yes, I admit it. We recently canceled our cable and now watch it online after we've put Paisley to bed. It's trash, I know, but it's crazy entertaining. - I hate math. I used to be really good at it in high school and college but not so much anymore. It really is one of those things that if you don't use it, you lose it. - My favorite food is chips & salsa & queso. I could have it every day for every meal and still want it tomorrow. - I want to live on a beach somewhere but my family keeps me in Oklahoma. I am very close to my family and want my kids to be close to their aunts, uncles, grandparents and great-grandparents so it's either we all move together or we all stay. I will live near water one day, even if it's by the lake when my kids are off to college. Jamaica - I miss you. - My taste in movies has changed DRAMATICALLY since I was pregnant and now a mom. I used to enjoy a good scary movie from time to time, now I find myself only wanting to watch comedies, sappy girlie movies or animated pics. Geez. Oh, and sappy commercials make me cry now. Hormones. - I really enjoy cooking. If I had to start my career all over (at 18 and back in college, not now) I think I would have enjoyed being a chef. - Along that note, I love good food. Eric and I plan our vacations around food. I really want Bobby Flay to stop by my house and cook me up a treat. MMM. Dream come true. - I wear socks like they are shoes. It used to drive my mom nuts growing up because I would wear them outside and destroy my white socks. Well, mom, that hasn't changed. - I want to be the best at everything I do. It's sad really because I end up quitting a lot of things I try when I realize I'm not any good at it. For example: gymnastics, volleyball, track...I could go on and on (and not just about sports:) ) This is something I'd like to change about myself. - I have shot a turkey. I don't have much to add to that. - I like working puzzles. The 1000+ piece kind. I can work on a puzzle for hours and just get lost in it. I'm a nerd. - Gummy bears are my favorite candy. And not just any gummy bear, but Haribo Gold Bears. I ate a 3 lb. bag that Eric got me. - I have the most talented family EVER. My dad is a grill-master extraordinaire, my mom decorates and sews, my sister is a photog-blogger-decorator, my brother-in-law sings and plays guitar, my aunt quilts, my uncle is also a grill master, my grandma quilts and my grandpa is a woodworker. - I want to be a better wife, friend, sister, daughter, etc. and find my relationships are better when my relationship with Jesus is better. So, if I really knew you, what would I know? I would personally like to point out to Nana that Aunt was listed before grandparents on the list of who Paisley should grow up around. Point made. Thanks for the kind words Jenny, you're too sweet!